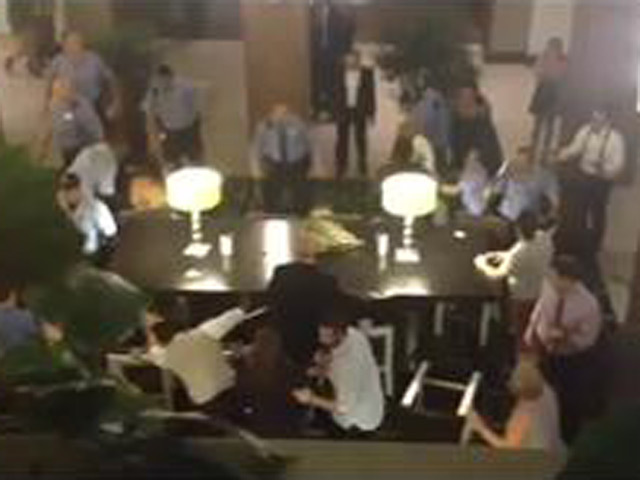 (CBS) PHILADELPHIA - Police said a man died of a heart attack and three men were arrested amid a massive wedding brawl that broke out at a hotel early Sunday in downtown Philadelphia, CBS Philly reports. At least two separate wedding parties got into a fight that began inside a Sheraton hotel in the Society Hill section of Philadelphia, police said. Dozens of people were involved. The brawl spilled out into the street and police were called in around 1:30 a.m.
Eyewitnesses told CBS Philly that the fight began in the lobby and escalated to the point where the cops requested a 3rd assist, which is an all-hands-on-deck call. The melee was caught on tape and posted to YouTube. Authorities said one man was charged with assaulting an officer. The other two men were released with no charges. Police said a 57-year-old guest suffered a fatal heart attack outside the reception and died at Jefferson Hospital around 2:50 a.m. They don't know if he was involved in any of the fights. Police said they don't know what started the brawl, but alcohol was involved, according to The Associated Press. Investigators haven't released any of the names of those involved. Philadelphia Police Commissioner Charles Ramsey has watched the video and he will consult the district attorney about filing charges against more of the brawlers, police said. In a statement, a spokesperson for the Sheraton said they are cooperating with authorities and offered their condolences to the family for their loss.